If there was a cosmic play with the universe as its stage and the celestial bodies as its actors, undoubtedly there would be one character more notorious than the rest; a villain feared by all: the infamous Black Hole. Black holes are about as treacherous as an antagonist can get. After all, they lurk in the darkness wearing the best camouflage in the universe. Once they get ahold of you, they never let go. And if that weren’t bad enough, they never die (at least, not for 10^67 years or more). They are truly the things of nightmares, and for one little star out there, that nightmare came true. This is the tale of that star, but I should warn you: this is a tragedy, not a comedy. It all started on March 28, 2011, when NASA’s Swift satellite detected an X-ray signal coming from the constellation Draco (This has been covered at Astrobites before, in a slightly different context). Bright X-ray sources in the sky often come from active galactic nuclei (AGN), distant galaxies that house a supermassive black hole (SMBH) in their center. As the SMBH pulls in material around it, the material heats up and forms an accretion disc. Temperatures get high enough for X-rays to be emitted. But, that wasn’t the case with this object, dubbed Swift J1644+57, which had always been dark in X-rays. Only recently had the center of the galaxy lit up. The black hole had been lying dormant before a helpless passerby—a star in this case—wandered into its trap. Figure 1: How a wandering star becomes lunch. Black holes consuming stars has been observed many times in the past (see related Astrobites articles here and here), but this one is special because it is a supermassive black hole, rather than a stellar-mass or intermediate-mass black hole. Here’s the breakdown of what happened that fateful day (Fig. 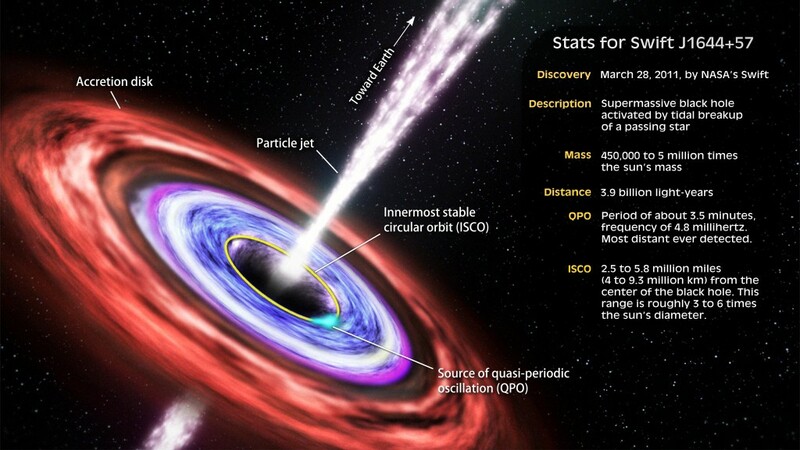 1): A wandering star passed near the supermassive black hole. As it approached, intense tidal forces distorted the star and began to rip it apart. The stellar material circled in towards the black hole and heated up to millions of degrees. Gas at that temperature emits X-rays, which is what was seen here at Earth. As material began to fall into the black hole, two large jets formed along the black hole’s rotational axis. The formation of these jets are not entirely understood, but it is believed to be a result of twisted magnetic fields that accelerate material away from the black hole at nearly the speed of light. The in-falling matter causes the X-rays to flicker slightly around certain frequencies. This flickering phenomenon is called a quasi-periodic oscillation (QPO), and serves as a rare glimpse into the regions closest to the event horizon of the black hole. The frequency of this QPO was about 5 mHz. If we could hear sounds at frequencies that low, it would sound like a D-sharp. 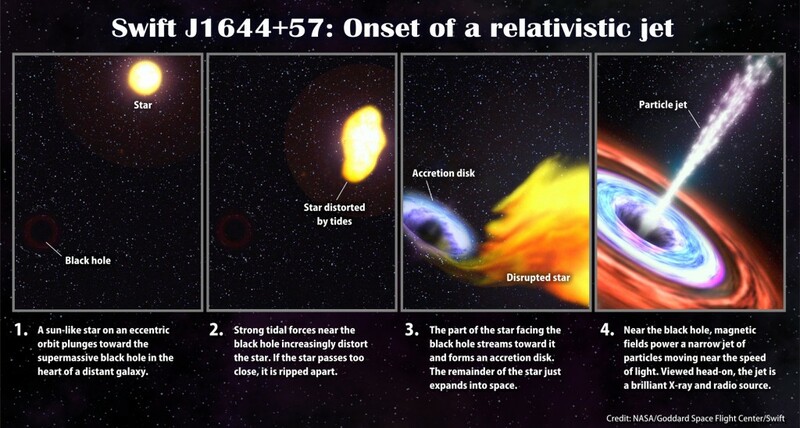 This star screamed as it was slowly devoured by the black hole. The poor thing never stood a chance. Although the death of a star may be sad (and frightening), the star does not die in vain. Surprisingly, observing the quasi-periodic oscillations of the doomed giant can help us better understand general relativity. The subject of study in this case is the Lense-Thirring effect. The idea is that massive rotating bodies drag space itself around them. If an object is revolving around that massive rotating body, its plane of revolution will precess. The problem is that we don’t have many super massive and rapidly rotating objects laying around that we can use to test this idea. Thanks to QPO’s, physicists have the laboratory they need to study this phenomenon. The authors haven’t conducted any relativity studies with this information yet, but the resources are there and somebody is likely to use it before too long.